George Latella was born in 1947 in Staten Island, New York. After completing his Bachelor of Science degree in Mathematics from the City College of New York, he enlisted in the U.S. Air Force Reserve for Officer Training School on October 16, 1969, and went on active duty to begin OTS on February 11, 1970, graduating with a commission as a 2d Lt in the Air Force on May 18, 1970. 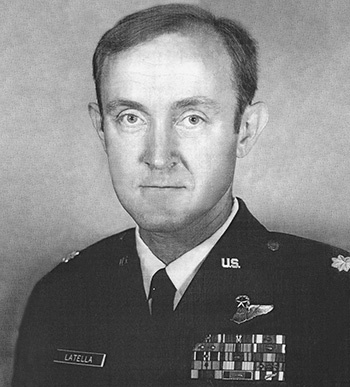 Lt Latella next attended Undergraduate Pilot Training at Craig AFB, Alabama, from June to July 1970, and then switched to Undergraduate Navigator Training, earning his navigator wings at Mather AFB, California, in July 1971. After completing F-4 Phantom II Combat Crew Training, Lt Latella served as an F-4 Weapon Systems Officer (WSO) with the 390th Tactical Fighter Squadron at DaNang AB, South Vietnam, from April to June 1972, and then as an F-4 WSO with the 25th Tactical Fighter Squadron at Ubon Royal Thai AFB, Thailand, from June 1972 until he was forced to eject over North Vietnam and was taken as a Prisoner of War on October 6, 1972. After spending 175 days in captivity, he was released during Operation Homecoming on March 29, 1973. He was briefly hospitalized to recover from his injuries at Westover AFB, Massachusetts, and then served as an F-111 Aardvark WSO with the 522nd Tactical Fighter Squadron and as a Stan/Eval Officer with the 27th Tactical Fighter Wing at Cannon AFB, New Mexico, from October 1973 to May 1979, followed by service as as an F-111 WSO with the 492nd Tactical Fighter Squadron and as Chief of Wing Radar Strike for the 48th Tactical Fighter Wing at RAF Lakenheath, England, from May 1979 to September 1982. Maj Latella next returned to Cannon AFB, where he served as an F-111 WSO and as an F-111 Instructor Weapon Systems Officer with the 524th Tactical Fighter Training Squadron, as Chief of the Squadron Radar Strike Section of the 523rd Tactical Fighter Squadron, and as Chief of the Radar Strike Division with the 27th Tactical Fighter Wing from October 1982 to January 1987. 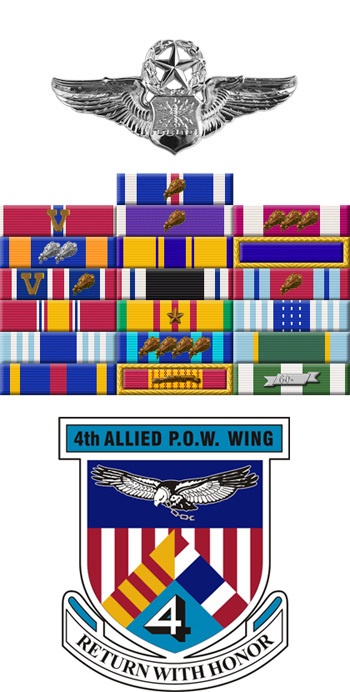 His final assignment was as Operations Officer for Detachment 12, 2nd Aircraft Delivery Group, at Kadena AB, Okinawa, from February 1987 until his retirement from the Air Force on March 1, 1990. First Lieutenant George F. Latella distinguished himself by extraordinary achievement while participating in aerial flight as a Weapon Systems Officer over Southeast Asia on 16 August 1972. On that date, Lieutenant Latella participated in a strike flight on an assigned mission deep within hostile territory. Braving many surface-to-air missiles fired at his flight and countless rounds of antiaircraft artillery fire over the target area, Lieutenant Latella was successful in directing his ordnance on the objective, thereby interdicting a valuable supply line that was heavily used by the hostile forces. The professional competence, aerial skill and devotion to duty displayed by Lieutenant Latella reflect great credit upon himself and the United States Air Force.